Shafts of morning sunlight reveal a world beneath the forest canopy and a hidden image - a world where, for a wondrous moment, man and nature exist in perfect harmony. 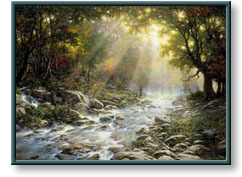 Image Size: 15.5" x 20"
River of Light copyright© 1999 by Larry Dyke is prohibited from being copied. All applicable copyright© laws apply and are reserved by artist Larry Dyke.